Happy Sunday and Happy Father’s Day! After my workout, I’m headed to brunch with my dad, who has taught me so much about life, appreciation, and most importantly, balance. I’m so lucky to be living in the same city as him again, and I’m grateful for everything he does for me and his constant support. 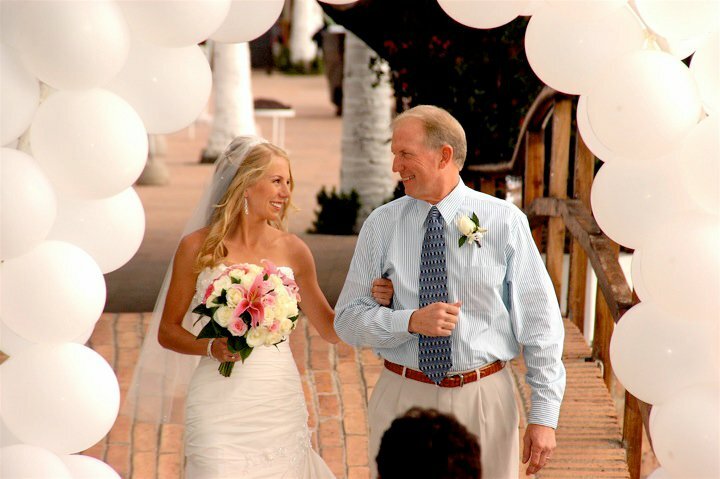 I’m also very lucky to have a wonderful, funny, and supportive father-in-law! Gary keeps everyone around him constantly laughing, and loves following Kevin and I on our running, work, and life journeys. 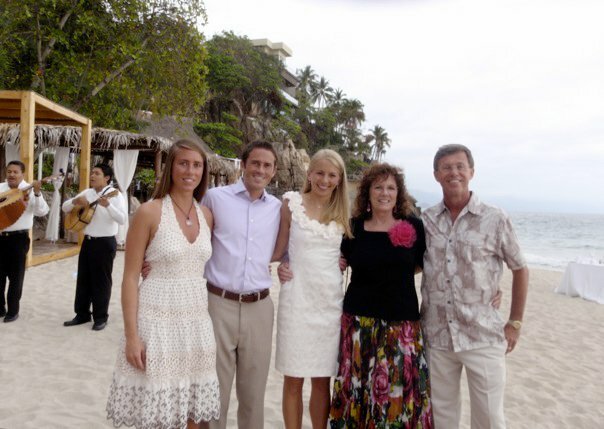 I can’t wait to spend vacation in Colorado with both my parents and my in-laws in just a few weeks! As much as I love my Dad and father-in-law, I’m pretty sure they’re not the reason you’re reading this post. So let’s get into this weekend’s 7 Tips … 7 Healthy Swaps you can make to your food, to boost the nutrition without sacrificing taste! I love eating healthily, but I don’t really want to feel like I’m eating “diet food” or giving up on taste. 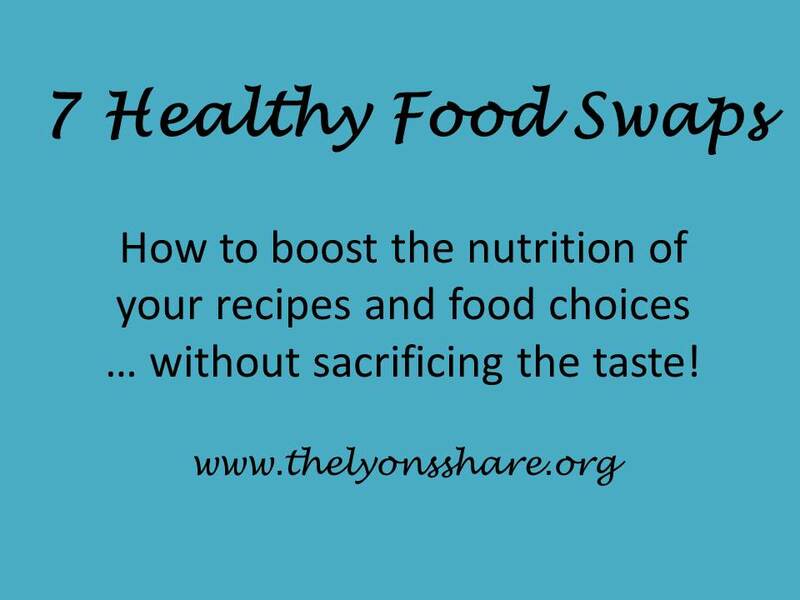 I use these healthy swaps as a perfect way to sneak in nutritious choices as often as possible! Grain swaps. White rice and pasta are fairly low in nutrients and fiber, and can spike your insulin levels due to the high glycemic index. I love to swap in brown rice, quinoa, freekeh, barley, millet, or other whole grains, and leave out the white rice. You can read more about whole grains in my post here. I also love to use spaghetti squash instead of pasta! It’s a great way to add volume and vegetables, but feel like you’re eating comfort food. Ground beef swaps. Standard ground beef can be pretty heavy in saturated fat, and unless you’re getting grass-fed, organic beef, can have a lots of hormones that you’re better off without. For a high-protein, low-fat, healthy alternative, I like 99% lean ground turkey in chili, soup, as burgers, or in other recipes. Diced Portobello mushrooms, crumbled tofu, or black beans also provide great alternatives to standard ground beef, if you’re not tied to the exact flavor/ texture of beef. Butter swaps. Although I don’t do it all the time, I love baking. But most recipes call for a bunch of sugar and butter, and I don’t always want to consume those in high quantities. Did you know that you can substitute canned pumpkin or unsweetened applesauce for butter in most baked goods? Applesauce usually works better for lighter breads, cakes, or muffins, and pumpkin works better for denser breads, cookies, or brownies. You save a ton of fat, and add in nutrients and fiber … a win-win! Other baking swaps. I like to use whole wheat flour, brown rice flour, quinoa flour, or coconut flour instead of standard white flour while I’m baking, because they generally add a bit of fiber, a boost of nutrients, and keep my blood sugar more stable. I also sub in mashed banana for some of the sugar and oil – bananas are a great natural sweetener, plus you get some fiber, vitamins, and potassium! Salad dressing swaps. Most packaged salad dressings are loaded with unnecessary fat, calories, sugars, and preservatives. Like I mentioned in my post on “Building a Healthy Salad,” olive oil and vinegar, lemon juice, herbs and spices, salsa, or hummus can be great alternatives to standard packaged dressings. French fry swaps. Everyone loves the taste of french fries, but the fact that they’re … well, fried … makes them less than ideal, nutritionally. Baking fries at home is a great healthy alternative, and still tastes delicious! Just slice up some potatoes, spray with olive oil and salt, and bake at 400 for 20 minutes or so. I also love baking sweet potato fries, parsnip fries, and rutabaga fries! Mayonnaise swaps. After an unfortunate incident with an industrial-sized tub of mayonnaise (long story for another day! ), mayo is one thing that is on my “avoid-at-all-costs” lists. Lucky for me, it’s not all that great nutritionally – commercial versions are high in omega-6 fats (which need to be balanced by omega-3s), preservatives, and MSG. In place of mayo as a sandwich topper, I recommend using a few slices of avocado. Avocado is loaded with vitamins, minerals, and healthy monounsaturated fat – and it’s delicious!! If you don’t have avocado, go for mustard or hummus as a sandwich spread. If you’re using mayo for a salad (like potato salad or tuna salad), try Greek yogurt instead. It sounds strange, but you won’t even detect the switch! I actually used four of these healthy swaps last night, as I made turkey, quinoa, and vegetable stuffed peppers for dinner, and baked up a healthy banana-apple-blueberry bread for dessert. They were both delicious! So tell me in the comments … which of these healthy swaps do you use? Do you have any others to add? 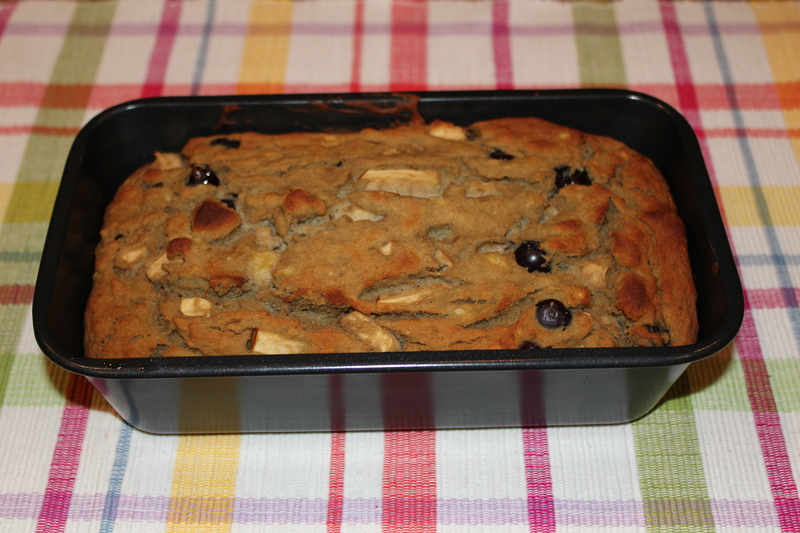 Would you rather see the stuffed pepper recipe or the banana-apple-blueberry bread recipe for next week’s Foodie Friday? Thanks to my sister Lindsey for suggesting the idea for this post!!! I vote for the stuffed pepper recipe for Foodie Friday! My new wife Holly and I are excited to try some of the grain swaps and French fry swaps. We use brown rice and quinoa pretty regularly, but haven’t heard of any of the others. We also use ground bison as a ground beef swap. It is lower in cholesterol and fat content than beef and has a slightly sweet flavor. Usually we make a ragu or bolognese sauce with the bison to put over spaghetti squash. Hey Teddy, that’s such a great suggestion! Bison is super lean and is a really good alternative to ground beef. I’ve actually never had it myself, which is why it isn’t top of mind for me, but maybe you will be my inspiration to try it! I vote for the stuffed peppers, always a favorite meal in the Lyons household. 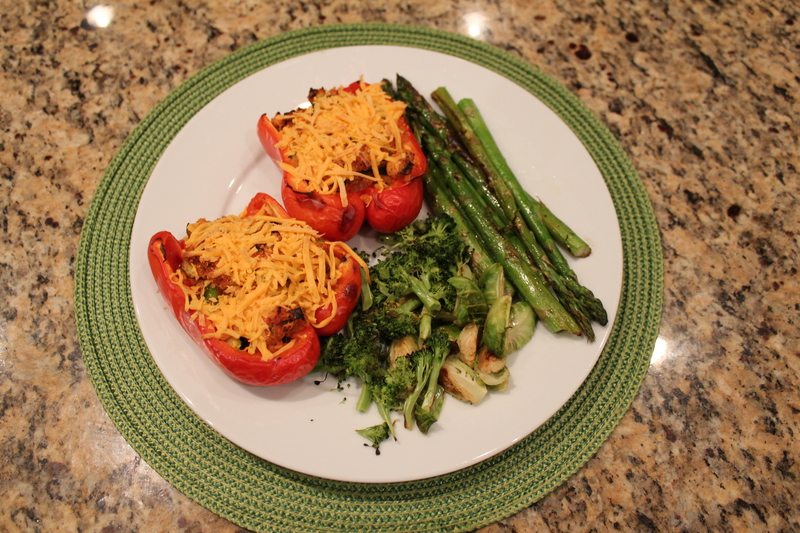 I vote for Turkey-Quinoa-Veggie Stuffed Peppers! I just made this recipe for girl’s night last week and I highly recommend it: Zucchini with Quinoa stuffing. I didn’t hollow out the zuccinis – I just poured the stuffing on top. This looks great, Michelle! I have made a similar stuffed zucchini before … I think it had black beans. Looks like a similar taste to my stuffed peppers! I often use brown rice and whole wheat flour, and no one in my family even realizes it 🙂 I have used applesauce instead of butter or oil before, but not lately. I’m goign to try that one again next time I bake! You’re so sneaky! Way to get those nutrients into those cute kids, Katie! Yay! Glad you were able to do this post- excellent ideas! I love sweet potato fries and I made beet chips as well. They weren’t quite as crispy but ill try again! Ill have to try applesauce instead of butter- how does that impact texture? Beet chips?!? That sounds amazing! For most veggie chips, “low and slow” is the best way to get them crispy (lower temperature but cook for a longer time). But I’ve never tried beet chips – sounds awesome! If you’re baking, applesauce shouldn’t impact the texture much at all. If you want, go half and half with butter and applesauce to experiment, and then transition all the way!